For those familiar with the Women’s Health Initiative (WHI) that was sponsored by the National Institutes of Health the link between oral contraceptives and breast cancer is no surprise. Women who participated in the WHI and who used a combination of Premarin and Provera had an increased risk of breast cancer, heart disease, blood clots, and stroke. Premarin contains estrogens from horses and Provera is the brand name for medroxyprogesterone acetate. They are not messenger chemicals that are normally found in the human body. This article makes the mistake of referring to oral contraceptives as hormones. These chemicals do not meet the dictionary definition of hormone because they are not produced by the hormone glands of the human body. Because they are not normally found in the human body they have a different effect on the body’s hormone receptors: that effect is one of hormone disruption. The estrogen component of the “estrogen+progestin-based birth control” consists of non-bioidentical chemicals like ethinyl estradiol that is not found in the human body. Likewise, the progestin component consists of chemicals like norethindrone that is not produced by the human body. Similar chemicals are also found in injectable contraceptives such as Depo Provera and implanted contraceptives such as Norplant and IUDs. The side effect profiles of Premarin and non-bioidentical “estrogens” and Provera and so-called progestins is similar. It is unfortunate that many physicians prescribe them inappropriately not only for contraception but also for complaints of acne or diagnoses of polycystic ovarian syndrome, and amenorrhea. It is my opinion that these chemicals have no place in the human body because they poison hormone receptors and disrupt hormone physiology throughout the body. If a woman seeks contraception I recommend natural family planning or barrier contraceptives such as condoms, diaphragms, and cervical caps. A cancer awareness group says as schools pass out birth control to young girls, they are failing to notify them about an increased health risk. increased risk for breast, cervix, and liver cancer. World Health Organization conducted a study in 2005 and found that type of birth control carcinogenic. Malec believes the worst time in a young woman’s life to be exposed to this level of carcinogen is before the birth of her first child. The Coalition is urging concerned parents and individuals to contact their school officials. I received this note today from one of my patients. She is 47 year old white female who started using oral HCG in early April 2009. She is 5 feet tall and weighed 107.2 lbs at the time of the first appointment. Based on her height and weight her starting BMI (body mass index) was 21. Conventionally, most people, doctors and lay people alike, don’t see anything wrong with that. However, this patient knew that she had an excessive amount of abnormal fat. She was especially concerned about the abnormal fat on her buttocks and thighs. However, she reported that none of her doctors was willing to treat her. She is a classical example of a person who is normal weight but obese. I define obesity as an excess of abnormal fat, regardless of actual body weight. Everybody knows when their body shape changes. Unless you are a body builder, this is usually due to a combination of loss of lean body mass and an increase of abnormal fat deposits. As people get older they also lose bone mass. HCG (human chorionic gonadotropin) worked very well for her. She was able to reduce the abnormal fat deposits significantly and reshape her body. As of May 2009 her body weight is about 90 lbs. In addition to losing the abnormal fat the patient also reported that she no longer had sleeping problems or other symptoms associated with being postmenopausal. to learn about my personal weight loss story and to read other patient case histories. This is off-topic but important enough to share because I had a hard time finding the solution to this problem. About one month ago I started having problems when doing Google searches using Internet Explorer and Maxthon. Whenever I did a search it would get a listing of websites with correct descriptions but the links would be completely different, rendering Google searches useless. Most of the websites were related to shopping and other junk and scam sites unrelated to the search keywords. Later I discovered that this affected all search engines, including Yahoo! and Windows Live. Luckily, I was still able to use FireFox to do Google searches. However, even though I was able to find other people who had experienced the same problem, nobody had found a solution. I tried Spyware Search and Destroy and Fixwareout.exe but they did not solve the problem. I was seriously considering doing a clean install of Windows XP. Yesterday, I found that I had the same problem with Google searches on FireFox, but Google searches on Google Chrome still worked. Today I discovered that even searches on Google Chrome failed. Then I remembered that whenever I did an Internet search I saw “waiting for 7.7.7.0” at the bottom of the browser window. So I did another Internet search and found the solution to the problem. The malware is inserting script src = 7.7.7.0 in the head of a Google search results page. This application is corrupting the valid URLs to point to scam sites. No other virus/malware checker, including Spybot found any problems, despite running the latest definition updates. None of my other computers have the wdmaud.sys file. So after I went to C:/Windows/system32/ and deleted wdmaud.sys everything was working great again! As I am writing this I am reminded how this applies to the holistic health. Conventional medicine often uses drastic measures such as surgery or drugs. I was pretty close to reformatting my hard drive and doing a clean install of my computer operating system. However, careful analysis of the problem eventually led me to the solution. One of the reasons that I have been so successful in holistic medicine is that thorough analysis is a routine part of my practice. Once you know what all the patient’s signs and symptoms are it becomes much easier to help them. When I use NeuroModulation Technique, an advanced method of energy healing, to help my patients I use a computer analogy to explain to them how it works. We use the metaphor of information faults and data corruption. We scan for these and by using correction statements we are able to resolve these and restore the patient’s health. This is how I have been able to help patients with autism, allergies, and many other health problems. This afternoon I watched the Oprah Winfrey Show with featured guest Suzanne Somers speaking on the topic of bioidentical hormone therapy. Suzanne Somers has been an important advocate for bioidentical hormone replacement and anti-aging medicine in general. She is now 62 and looks great! I enjoyed watching the show and seeing many women explain how bioidentical hormone replacement therapy has given them their lives back. There was one obstetrician gynecologist from Northwestern University who had an opposing viewpoint. I’m sure that after watching the show many women had questions and reasons to rethink any treatment that they may have been receiving for perimenopausal or postmenopausal hormonal imbalances. In my medical practice I first started with statically dosed bioidentical hormone replacement therapy and now I use rhythmically dosed bioidentical hormone replacement therapy. I have found the latter to be vastly superior. Premarin and PremPro are FDA approved but contain estrogens derived from horse urine and the latter also contains medroxyprogesterone, a non-bioidentical chemical that has been shown to increase the risk of breast cancer, heart disease, and stroke. As I sought to learn all about BHRT I read many books and attended seminars by Dr. Thierry Hertoghe, Dr. Jonathan Wright, Dr. Eldred Taylor, and T.S. Wiley. Ironically, the one that I found to be most helpful was not taught by a health professional: T.S. Wiley. So like Suzanne Somers I endorse the Wiley Protocol (http://www.thewileyprotocol.com) and have seen outstanding results in my patients. Women feel like they are able to get their lives back, just like the women on Oprah today. 1) The hormones are identical to the ones that the human body makes. 2) Because the hormones are bioidentical they are able to form a perfect fit with the body’s hormone receptors, which results in physiological responses when dosed properly. 3) Dosing of the hormones is rhythmic and follows the pattern that we see in healthy young women with estradiol peaking on Day 12 and progesterone peaking on Day 21. 4) Among other things, the peak of estradiol on Day 12 causes activation of the progesterone and testosterone receptors, allowing these hormones to work better. 5) We are able to verify that women use the optimal amount of estradiol and progesterone by checking the levels on Day 12 and Day 21 of the cycle. 6) For postmenopausal women we synchronize the dosing schedule with the cycle of the moon. 7) Symptom relief is excellent. It simply works and patients are very happy with it. 8 ) Absence of side effects when dosed properly. 9) All the Wiley Registered Pharmacies use the same methods and raw materials to compound the Wiley Protocol hormones. This is very important! Standardization means that you can be sure that the Wiley Protocol hormones are exactly the same whether you get them from Knowles Apothecary in Kensington, Maryland, or any other Wiley Registered Pharmacy in North America. The same cannot be said about other compounded hormones. There is no standard method for compounding Bi-Est and Tri-Est (estradiol/estriol +/- estrone combinations developed by Dr. Jonathan Wright) and other hormone creams. Different pharmacies use different compounding methods, raw materials, and bases to make these hormones so absorption and bioavailability may vary from pharmacy to pharmacy and even within the same batch if the hormones are not mixed properly. 10) The route of delivery is transdermal which is convenient and optimal compared to hormone injections, capsules, troches, and pellets. Transdermal application of hormones allows for rhythmic dosing, and absorption into the fat base creates a depot that fosters steady state serum levels of hormone. Oral estradiol produces undesirable changes in C-reactive protein and metabolites from the first-pass effect through the liver. This is the history of a 10 year old boy with a diagnosis of autism who showed remarkable improvement over the course of six weeks of treatment with NeuroModulation Technique. The boy was the second oldest of three children who lived with his mother and two other siblings. He was healthy at birth and developed normally. He received all childhood immunizations and at age four the following changes manifested: drooling, tantrums, loss of the ability to repeat words, compromise of expressive and receptive communication abilities, and clumsiness and reduced coordination. There were problems with motor skills that especially affected his hands and he exhibited clumsiness when walking. By age seven he developed obesity because of various psychotropic medications that physicians had prescribed. By the time the patient presented for NMT treatment all medications had been discontinued. The patient’s mother reported the following improvements since the start of NMT treatment. About three to four weeks after the start of NMT treatment the mother had a meeting with one of her son’s teachers. The teacher reported that about three weeks prior to the meeting she noticed that the boy had become more mature and that he answered questions in class properly. At that time the mother did not think that it was because of the NMT treatment, but later on she made the connection when she realized that the NMT treatment had started three to four weeks previously. The mother also stated that she had not told the teacher that her son was receiving NMT treatment. So the teacher shared her observations spontaneously. The boy has continued to improve and to do very well in school. In the past couple of months all his spelling tests have been 100% even though they are more advanced and challenging now. He is also doing better in mathematics. He is still below grade level for his age but improving. Overall, he makes more sense when he talks. Now he can watch a movie or read a book and talk about it clearly. Before the NMT treatment he did not make much sense when he tried to talk about a book or movie. Before NMT treatment he was very scared of the dark but that is much better now. Also, it used to be impossible for him to be at home without his mother because he would cry and yell, but now he is fine when his mother is not there. When his father came to pick him up once a week for visits he used to refuse to go with him. However, since the NMT treatment he has been willing to go with his father. His relationship with his younger sister has changed also. He used to prefer to be by himself and to not be bothered. Now he and his sister are spending more time together. They do fight from time to time, but now it is not because he wants to be left alone but instead it is because they are competing with each other. When he first came to my office he played a lot with strips of plastic from plastic bags. He used to tie the strips together into a ball and play with it constantly. He exhibits this behavior much less now. He used to laugh at inappropriate times and this has improved since NMT treatment. His eating is more varied now. He is willing to try all kinds of food now. Finally, the boy’s psychologist recently discharged him from treatment because she felt that he had met all treatment goals. Needless to say, the boy’s mother was very pleased that the NMT treatment resulted in such an improvement in her son’s autism. No Vaccinations = No Autism? Isn’t it incredible that the prevalence of autism in the United States is now one in every 150 children born in the United States? Have you considered why? Here is some food for thought. Article on Mercola.com: Why don’t the Amish Have Autistic Children? It looks like this was reported in the Washington Times on April 18 and 19, 2005, but I was not able to locate these articles. This webpage has a lot of resources. It has quotes from physicians who treat the Amish or homeschooled children. Age of Autism: Seeking the truth about the never-vaccinated. Love for Life: Children that aren’t vaccinated never get Autism! Said Dr. Mayer Eisenstein Homefirst’s Medical Director and Founder 1973. Alternative Link. Generation Rescue: the Age of Autism: Study sees vaccine risk. Please share with everyone who has vaccine age children. However, everyone needs to know about this because vaccine injuries may happen to adults also. What kind of rash is this? 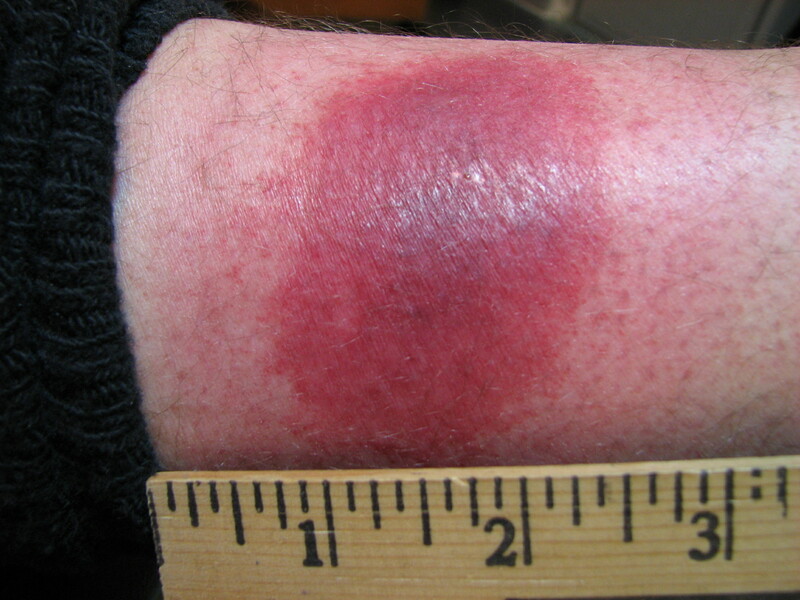 This 38 year old male presented to me on Monday, November 24, 2008, with a chief complaint of an oval shaped rash on the inside of his right leg, just above the ankle. He discovered it on the evening of Sunday, November 23, 2008, because of symptoms of itching and pain. At the time of discovery it was the size of the dark red area in the photo below. Since then the rash has expanded concentrically into an area that shows lesser degrees of inflammation and which measures 5 x 3.5 inches. In the twelve hours preceding the first office visit the central area has become darker. The central part of the rash is warm to the touch. He experiences discomfort when walking. There are no other significant systemic signs or symptoms. On Saturday, November 22, 2008, he spent some time in a neighborhood park and at a football game, but there is no history of insect bites. Have you seen a rash like this before? If so, do you know what may have caused it? What kind of treatment would you recommend? Rash above the ankle, on inside of right leg.